** There are a number of reserved parking spaces designated for use by customers with restricted mobility. 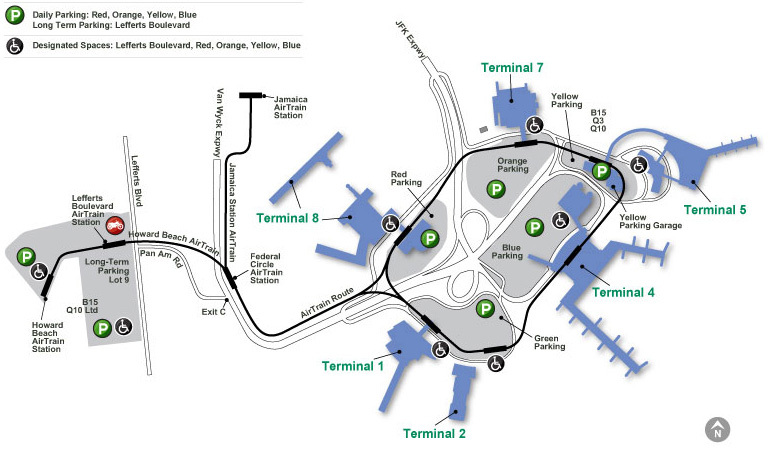 Designated spaces are located in each short-term parking lot near the terminal entrance, and in the long-term lot near the Howard Beach and Lefferts Boulevard AirTrain JFK stations. Official disabled license plates or other official permits issued by a municipality or state of residence must be prominently displayed in order to park in these reserved spaces. Pay for on-airport parking using cash, credit, debit or E-ZPass. To save time and exit quickly, use your credit or debit card at an Express Pay machine or have E-ZPass Plus activated on your E-ZPass tag and pay in the designated lane when exiting a lot. There is no parking in front of or next to any of our terminals, not even for a moment. Terminal frontages are for active loading and unloading only. Unattended vehicles will be towed at the owner's expense. When dropping off or picking up a passenger, we recommend you park your vehicle in one of our parking garages. As an alternative for those picking up a passenger, we also recommend using our free Cell Phone Lot. This lot is located less than five minutes from all terminals and provides a convenient place to wait for arriving flights, while helping to keep traffic at the airport moving smoothly. If you choose to enter the terminal with the passenger, please be aware that only ticketed passengers will be allowed past the security checkpoint. However, you may enjoy any of the areas before security. As an alternative, you may drop off your passengers at the Kiss and Fly located at the Lefferts Boulevard AirTrain Station where they can ride AirTrain free of charge to their terminal in just 10 minutes. Air travelers who own electric vehicles can charge them at Kennedy International. Learn more.